Key landscape plantings are scouted for pests and diseases to control problems. As part of Barrett Tree East’s plant health care services, we offer an integrated approach to managing landscape tree and plant health. 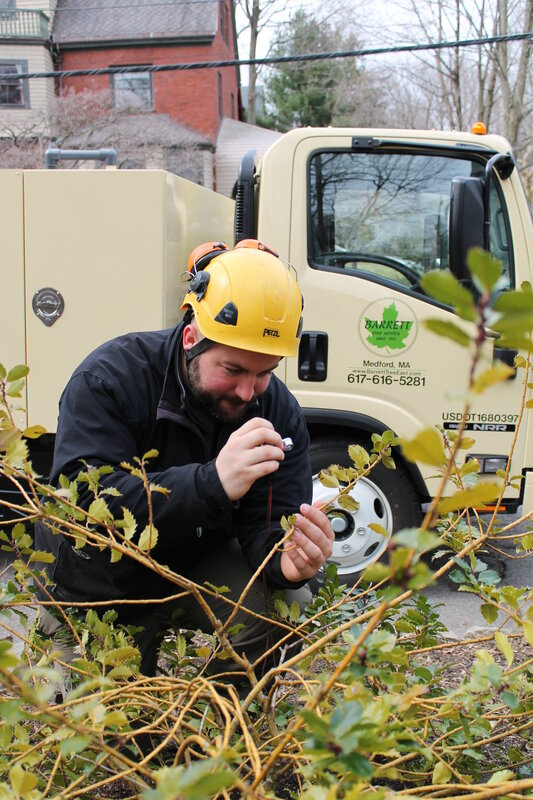 ActiveCare is our holistic horticultural program providing the peace of mind of knowing your trees are being cared for by knowledgeable, professional arborists. The goal of ActiveCare is simple - promote healthy plants through consistent monitoring and targeted control treatments. The ActiveCare philosophy expands traditional pest management by focusing on plant health over plant pests, resulting in reduced pesticides, while producing healthier plants and better aesthetics. Key landscape trees, shrubs and plantings of interest are evaluated seasonal visits by a Certified Arborist. Plants are scouted for pests and diseases and, when appropriate, targeted pesticides by licensed applicators are employed to control problems. Often pest and other cultural issues may be recognized and addressed early, before plant health is adversely affected. In many cases, disease problems can be diagnosed and treated long before irreversible damage is caused. By evaluating site specific growing issues, changes can be implemented to either reverse decline or promote vitality and health. The difference in a traditional pesticide programs is the foundation of ActiveCare, namely, frequent timely property visits and ongoing communication from your plant health practitioner. Each visit includes a report detailing what was observed, treated and any other pertinent information about your plants and landscape. ActiveCare programs are tailored to each individual property, as every landscape is unique. Typical programs include: soil analysis; nutrient application to individual plants; small scale soil conditioning treatments; insect and disease inspection and identification; pest management through targeted pesticides when plant health is threatened; recommendations and cultural concerns of note will be communicated throughout the season as conditions change through written reports after each site visit. The crawler stage of hemlock woolly adeldig as seen through a microscope. Consistent monitoring allows for careful intervention as an early detection often prevents larger problems. Because of the intensive proactive nature of the program and frequency of site visits, ActiveCare plant monitoring affords the utilization of softer control materials providing effective treatments and reduced pesticides.